A couple years ago, the NY Times published a recipe for "No-Knead Bread". I just took a loaf of this out of my oven a short time ago. It's has a beautiful carmelly crust, and the inside will be moist and de-lish, I'm sure. We've been using this recipe since it was published, and it has never disappointed us. Like the title says, you don't have to knead the dough. You mix the flour, salt, yeast, and water in a bowl one day. Cover it and let it rise overnight. The next day, you fold it onto your countertop, add a little flour, let it rise again, then bake. The process is contrary to what you would expect to do to make a near-perfect loaf of bread. The only challenge is that you have to plan ahead. It also doesn't keep for more than a day or two, like most homemade loaves. 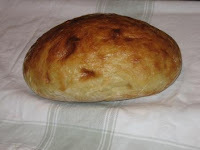 I cook the loaf in my Romertopf clay pot, which I think helps hold its shape and moisture. My husband, a man of more traditional bread-baking convictions (and skills), prefers to put it directly on a pizza stone in the oven. Either way, you will end up with a loaf that tastes like it came from an artisan bakery. Obviously, I hope you give it a try and enjoy it as much as we do. It sounds delicious but do you know of a no-rise bread? :-) But if kneading is needed I'll try it - I can practically smell it from your description!